Inscr. in pencil top right-hand corner: ‘CFM / OCT 3 / 96’. On 24 February 1939 the chairman of the National Portrait Gallery Trustees Sir Evan Charteris wrote to the director: ‘Dear Hake. 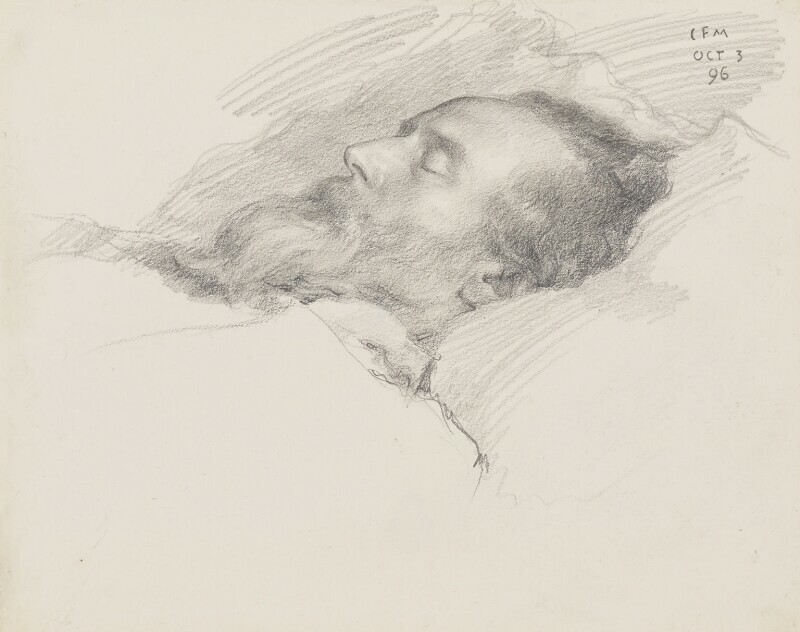 At our meeting at the Tate Tuesday we were offered & accepted two drawings by Charles Fairfax Murray of William Morris “done after death” – both of lovely quality. I sd we shld be glad of one at the N.P.G. on permanent loan – it was agreed to give effect to this.’  Charteris, who was at that time simultaneously chairman of the Gallery trustees, chairman of the Tate Gallery and a trustee of the National Gallery, was uniquely placed to advise on acquisitions for the national collections. Morris did not pay much attention to his own image (caricatures dominate the iconography, after photographs), and Murray may be called his most regular portraitist. The images he made range from drawings to oil paintings, and from 1870, when Morris was in his mid-thirties, to his death aged 62. As well as the watercolours of 1870 (see NPG 3652) other portraits by Murray include a half-length oil of about that date, recently given to the William Morris Gallery, Walthamstow, London,  and another painting, a half-length based on a photograph by Abel Lewis of 1880 (see ‘All known portraits, By other artists, c.1887’), in a British private collection. 1) Letter from Sir E. Charteris to Henry Hake, 24 Feb. , NPG RP 3021. 3) Blunt 1964, p.63; and Henderson 1967, p.363. 4) Dufty 1977, p.24, fig.28. 5) Painted for Emma Morris (W. Morris’s mother), c.1870s; William Morris G., Walthamstow, London, 22/1993. 6) NPG Annual Report 1956–7, p.6. Head on pillow, almost profile to left, sheet covering shoulders. On loan from the Tate Gallery, April 1939; ownership transferred from the Tate to the National Portrait Gallery, February 1957. The Art of the Book: William Morris and After, Fitzwilliam Museum, Cambridge, 1978 (no number).